1. We live on the 4th floor of an apartment. What floor is that really? 2. Our oven is in Celsius. If my American recipe tells me to bake something at 350F, at what temperature should I set my oven? 3. I have an American curling iron. If I use an adapter, can I safely use it in Portugal? 4. The doctor asks you for your height in meters and your weight in kg. What do you say? 5. If you are a healthy adult, what should your body temperature be in Celsius? 8. A fast food meal costs 5,50 euros. What is the price in dollars? 9. The door has a sign on it that says, “puxe”. What should you do? 10. You are ending a phone conversation. How many different ways should you and the other person say “good-bye” before you hang up? 11. Say the names of these letters in English. “A, E”. What letters did you just name in Portuguese? 12. It is 3:45 PM. How do you write that in Portugal? 13. If a Portuguese baby’s birthday is 10/4/12, when was he born? 14. A Portuguese family invites you to supper at 8:00 at their house. What time should you arrive, and what time will you start eating? 15. I am speaking to a stranger or someone to whom I want to show respect. How should I address her? 16. I am a woman being introduced to a Portuguese woman. Do I shake her hand? Would you like your answers now? Here they are! 1. Portuguese people call the first floor the 0 floor, so the second floor becomes the 1st floor, the third floor is the 2nd, etc. Our 4th floor apartment is really on the fifth floor. 6. One. They write their seven with a horizontal line through it. 7. Three thousand. They put a period where we write a comma. 8. First of all, 5,50 euros is like 5.50 euros. They use a comma where we write a period. Based on today’s exchange rate (which is always changing a bit), the price would be $7.17. 10. Generally, to be polite, each person says good-bye 3 or 4 ways. It is generally a hurried string of “Well then, kisses to all your family, good-bye, excuse me, excuse me, good-bye, good afternoon.” Click. I have been saying good-bye’s that whole time too, and after two more checks of the receiver to make sure noone is still bidding me farewell, I feel it is safe to hang up. 11. “A” is “E” here, and “E” is “I” here. 12. 15h45. Yes, military time with an “h” in place of the colon. 14. If you arrive before 7:50, they look surprised. Eating at 8:00 means more of get there around 8:00 and eat around 8:45-ish (for most people). 16. Nope! This is a culture of kisses on the cheeks. You give one kiss on each cheek (or touch cheeks and make a kissing sound in the air) when you greet someone. Women give kisses to women. Men give kisses to women. But men do not give kisses to men. They may do a handshake instead. So . . . How did you do on your cultural quiz? 0-4 correct — You are just like I was when I first arrived. There is still hope for you. 5-8 correct — You have broader world knowledge than most, or you are a very good guesser. 9-12 correct — Way to go! You should be a missionary. 13-16 correct — You must be Portuguese. Having the opening service at your new church building is like preparing for a wedding. 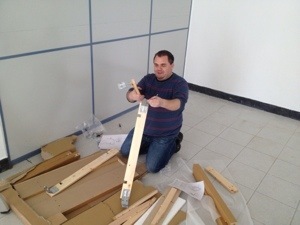 There are hundreds of details to take care of, but some things can only be done the day before. 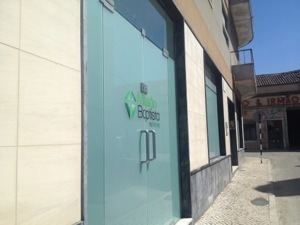 Such was the case for our building here in Montijo. For weeks, we had made invitations, planned the order of service, made decorations, and bought small items for the church. The contractors promised to have the walls, ceiling, and windows finished on Friday. That meant we had ONE DAY to get in the building and do everything else before our Sunday service. 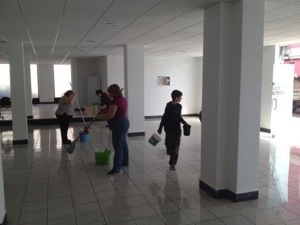 At 9:30 Saturday morning, the people from our Bible study showed up ready to work, and work they did! Marcelino pulled weeds out of the sidewalk cracks in front of the church. Fernando hung toilet paper dispensers and mirrors in the bathrooms. Eduarda mopped floors until she had callouses on her hands. Others cleaned windows, peeled plastic wrap off of new chairs, mounted the cross on the wall, hung wallpaper, decorated the children’s classroom, assembled new tables, and folded bulletins. By that evening, the plain, white building looked like a shiny, new church! On Sunday afternoon, people started pouring in. 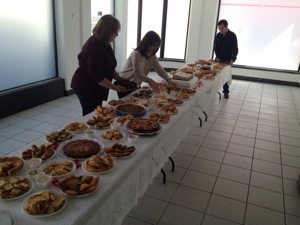 We had invited other churches from the Lisbon area as well as people from Montijo. We had borrowed extra chairs from another church, and, after all the chairs were full, people still kept coming! 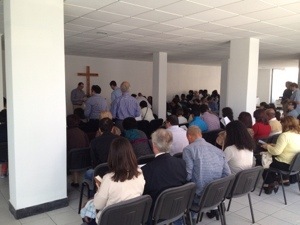 In all, 130 people attended the service! It was a sweet time of hearing testimonies of how God began the work in our town, watching a video of churches across America and Portugal praying for the work in Montijo, singing songs about God’s greatness, and hearing a message from God’s Word. 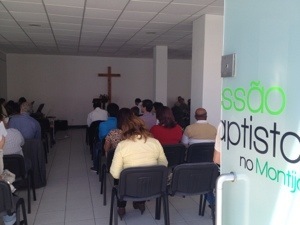 At the opening service, we had 7 new people from Montijo. We are excited about what God has done and are looking forward to next week. We are having an evangelistic service and hope that more new people from the community will come and understand what Jesus has done for them and how they can have a relationship with Him. As we reflect on the wonderful weekend here in Montijo, we ask you to do two things: 1. Pray! Ask God to protect and strengthen this fledgling work. 2. Praise God! He is doing great things. Thank you, thank you, thank you for helping make this day possible. Whether you prayed, sent money, visited us, or wrote us an encouraging note, you all had a part in starting Montijo’s Baptist Church. In our last prayer letter, we asked for some of our churches to send us a video of them praying for us. Watching this brings tears to our eyes because it makes us realize how vast God’s work is. Your prayer matters! For our inaugural service, we captioned this into Portuguese so that everybody could understand the prayers. It was a deeply moving moment because the people began to see how many people care about what is going on here. To all of you who had a part in this, thank you!